Ford Fiesta ST Performance, Engine, Ride, Handling | What Car? The Fiesta ST's engine is a cracker, and so much more soulful than a Renault Clio RS's or VW Polo GTI's. It pulls heartily from low revs and enjoys spinning up to its limiter, all the while accompanied by a muscular, growling soundtrack that’s enhanced tastefully by a "Sound Symposer" that pipes engine noise through to the interior, with proper pops and cracks from the sports exhaust complete the sound effects with a flourish. It's certainly the most aggressive three-cylinder motor we've encountered, and the standard six-speed manual gearbox, which has a short, slick, snappy lever and well-stacked gear ratios, helps you get the very best out of it. Backing off and cruising allows cylinder deactivation to occur — it can run on just two cylinders to save fuel — but it's extremely difficult to tell this is happening. There's nothing on the dash to indicate any switchover and no perceivable change in sound or smoothness inside. And, let's be honest, that’s exactly how it should be. 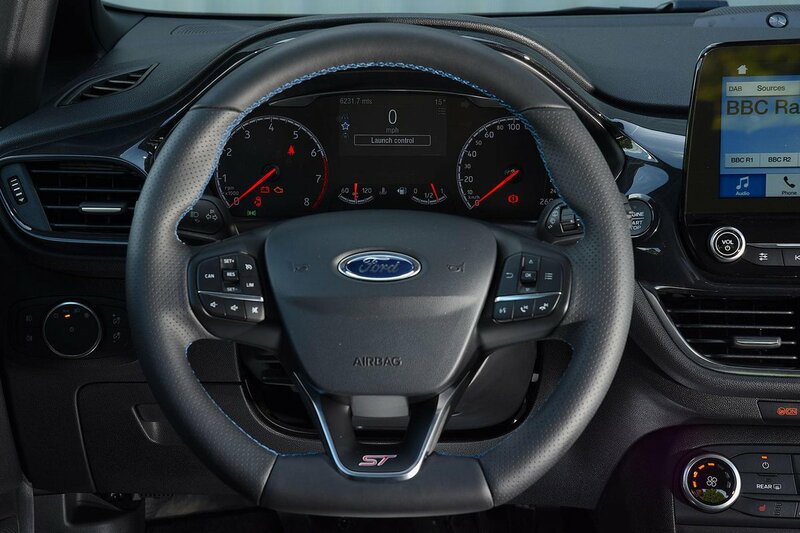 There are three driving modes available for the ST: Normal, Sport and Track. Moving to Sport from Normal makes the accelerator more responsive, adds weight to the steering and makes the exhaust more vocal. Moving to Track switches off the car's traction control and relaxes its stability control for maximum driver control and, of course, enjoyment. And this hottest of Fiestas is just as lively through corners as any before it. Just like the previous car, it will pivot progressively around its front wheels if you back off the accelerator mid-bend, to help you position it perfectly. The steering isn't the most communicative around the straight ahead and you can feel a bit of tugging from side to side as you power out of corners from low revs, but beyond such limitations it proves weighty and precise. And huge fun on a cracking British B-road. 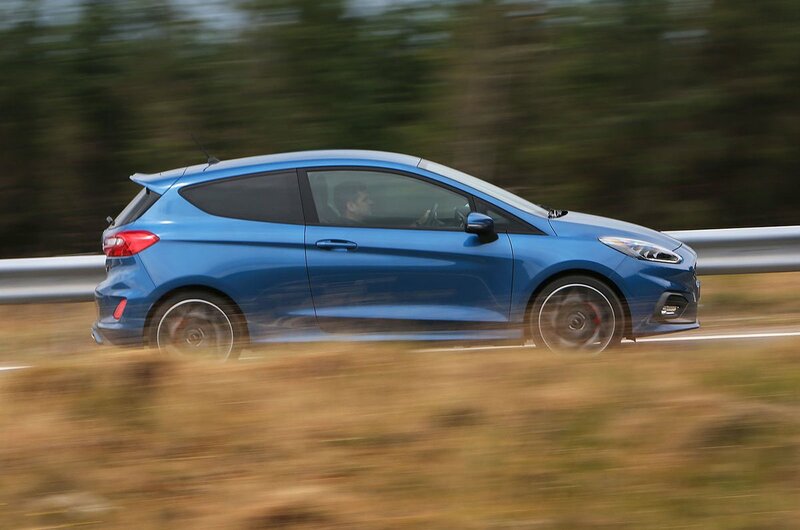 The limited-slip differential is available as part of a Performance Pack on lower trims, but standard on the range-topping ST-3 model. Working with the car's standard torque vectoring technology, the diff-equipped cars are able to put down their power more readily out of slow corners — by shoving drive to whichever front wheel can exert the most purchase. Without it, the car requires more patience with the accelerator as it scrabbles for traction, especially in the wet. With the Performance Pack you also get two more go-faster additions: a launch control system to torture the clutch and your passengers with, and shift lights, to tell you when you’re about to hit the engine's limiter. In truth, we could live without either system — they’re fun for five minutes but have little real-world advantage — but the limited-slip diff alone makes the Performance Pack worth adding. 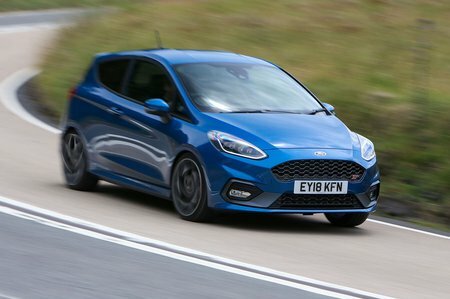 On the introduction of this latest Fiesta ST, Ford made a big noise that the ride had been softened to make it more comfortable. Much was said about clever, patented designs for the rear suspension that allowed this to happen without spoiling the handling. Well, the ST certainly takes corners as crisply as ever, but the ride, if anything, is more aggressive than before: we know this because we took the trouble to test old and new STs back to back. It's liveable for a hot hatchback, but if you're about to order a new model for a more relaxing life, think again. For the most comfortable hot hatch for this money, try the Polo GTI instead.